The house with a large property of 1000 m2 offers ideal conditions to all, which look for recovery. The house disposes of 6 apartments and 4 rooms. The house is about 400 meters (5-10min walking) from the sea away and has 3 terraces. One terrace is behind the house, the other two are in front of the house, where is a grill for free use. The house has a central heating and makes this a pleasant stay over the whole year, because it takes guests the whole year. The guest can choose between: only staying overnight, staying overnight with breakfast or half-board. There is the possibility to use the kitchen, the refrigerator, the washing machine, internet access and the telephone of the owner. Several parking lots are available for the guests. There are shopping possibilities in the proximity (100 m). It is 7km up to the police. The ambulance and gas station are only 600 m away. 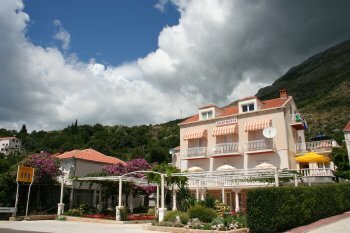 MLINI ... is to be found a little way south of Dubrovnik in the area called Zupa dubrovacka. Embraced by the sea and sheltered by mountains, Mlini has a mild and pleasan Mediterranean climate. Apart from or because of its peaceful sun, you enjoy swimming from spring to late autumn. Whatever you are looking for, Mlini is the place to stay and enjoy, for you and your family. 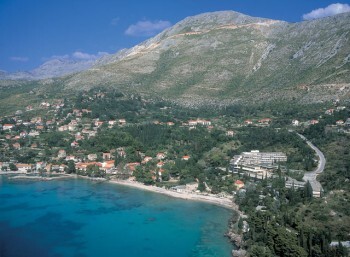 Being located between DUBROVNIK and its airport, hectic is far but still close enough. The name of the place comes from the mills (Mlini means "mills") that used to be moved by the waters of the rivulet Zavrelja. The brooks with many small falls still pass through the place and are today inhabited by innumerable ducks. The place abounds in historic monuments and many legends. According to one legend St. Hillary has burned down the dragon of Epidaurum on the beach of Mlini in the 4th century, thus saving Epidaurum from earthquakes, evil, attacks of barbarians and destruction. The little church of St. Hillary (Sv. Ilar) has been erected in the memory of the deliverer who has become the patron saint of this area. Mlini is one of the best developed tourists' resorts of the Dubrovnik area situated within a picturesque environment, beneath the historic mountain Spilan, almost penetrated into the shape of the mountain and the wooded rocky land. Pine trees, palms and secluded beaches, flowers and shady walkways are the features of Mlini.